I am so excited to present our first author interview at the Book Horde! This July our Goodreads group is reading the Texas historical saga Loyal Valley: Assassination and the author, Dr. Elisabeth G. Wolfe, very kindly agreed to lend us her time and attention. Book Horde: Before we start, should I call you Dr. Wolfe or Elisabeth? Elisabeth G. Wolfe: Oh, either is fine! BH: Thank you so much for doing this interview, Elisabeth. Can you tell us a bit about yourself? 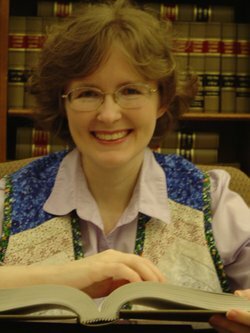 EGW: Professionally, aside from being a writer, I'm a freelance translator, editor, and indexer and an adjunct professor of English, teaching online for the Baptist College of Florida. Personally, I'm a child of the Reagan years and a naturalized Texan, a Baylor Bear and a St. Louis Cardinals fan, and I've lived in the Texas Hill Country for over 20 years. BH: How long have you been writing? EGW: Pretty much since I learned how to write! And we have tapes of me telling my parents stories I'd made up when I was even younger. BH: You wear a lot of hats - translator, editor, adjunct professor, and you seem to do a lot of community and volunteer work as well. How much time do you spend writing? EGW: It varies pretty wildly depending on what I'm working on and whether I need to focus on paying projects or school obligations, as well as how my health is holding up that day. It also depends on whether you count research time as writing time; some ideas take a while to track down if I have to search newspaper archives online or something. When I can block out the time and really get rolling, though, I may write eight hours a day or more. BH: When do you write best? EGW: When I can think straight! Time of day really doesn't matter all that much, although some days I'm not able to get started until late, either because of other obligations/distractions or because of migraines or allergies leaving me in a fog. EGW: Computer, definitely. It's easier for my hands to keep up with my brain that way, and it's easier to fix my mistakes when my dyslexia gets the better of me. BH: When I reviewed Loyal Valley: Assassination, one of the things I noted was that it felt a bit like I was reading a tv series. And in the group discussion you mentioned that you had originally conceived Loyal Valley as a tv series. EGW: I have to be honest: I cheered when I read that part of your review, because that confirmed for me that it would work on TV! I loved your tagline, too, because I was very definitely influenced by shows and books like Little House on the Prairie, Bonanza, and The Wild Wild West--in fact, I frequently re-watch Season 1 of TWWW when I'm preparing to work on a Loyal Valley story. Mission: Impossible is another series that's a strong influence, especially on Assassination, as is Hogan's Heroes. All those shows are classics in large part because the storytelling is strong, and there are qualities about them that a lot of series today, television and book, just don't have. That's not to say that there are no good shows on TV anymore, but even the best ones tend to insist on morally ambiguous protagonists and anti-heroes, not a fundamentally decent hero like John Wayne's characters or the Cartwrights or James West or even Bret Maverick. One of my goals with Loyal Valley is to recapture that old-school style of storytelling, whether on the page or on the screen. BH: Do you find it easier to write screenplays or novels? EGW: A lot depends on the story itself. Screenplays are actually fairly minimalist in terms of storytelling because you need to leave a certain degree of freedom for the director and the costume and set designers and so on, plus there's not much you can put on the page in terms of internal dialogue and more abstract qualities of things and people. In a short story, for example, you can just describe cursed torches as "not just unlit, but unlightable," and the reader understands what you're going for. In a short film... how do you get that across on the screen, and what do you have to put on the page to make it happen? (I'm a bit stuck on that one!) Conversely, in a novel, leaving all of the thoughts and descriptions out can make for awfully dull writing, but sometimes a character just won't let you into his head. (I'm looking at you, Jim Ferguson....) So I don't know that one is inherently easier than the other in general; it's just that some stories lend themselves more to one medium than the other. That said, screenwriting is the one creative writing class I took in grad school that was useful for more than constructive criticism. BH: You have another book, Look Behind You, that sounds quite different from the Loyal Valley Series. What can you tell us about it? EGW: Look Behind You started with a historical factoid. In 1939, on the outbreak of WWII, former Texas Ranger captain Frank Hamer wrote to King George VI offering the services of fifty retired Rangers, himself included, to protect the Channel ports against spies. King George was all for it, but the State Department had kittens, and the plan fell through. Hitler evidently found out about it somehow, though, and for several years his worst nightmare was that the Rangers were going to come after him. So I wondered: what if they did? The book started out as plain alt-history flash fiction, but in the process of expanding, it took on a fantasy element. I call it guns-and-Sidhe fantasy as opposed to sword-and-sorcery! I'm also planning other books in the series, set earlier in Texas history; the next, which has the working title of Palamedes Rides Again, will focus on a Shawnee Ranger in 1839. But right now Loyal Valley is my first priority. BH: If you could pick one word to describe the process of writing, what would it be? And please elaborate. EGW: Cathartic! Doing creative work, and especially writing, is a great stress reliever and always has been. Sometimes it's a matter of exercising a different part of my brain than I use for translation or teaching; sometimes it's a matter of doing something fun for a change; sometimes I have to get the idea out of my head; and sometimes... well, sometimes I just need to kill some fictional villains because it's too late in the day to go to the gun range. BH: What do you do in your spare time and what's your latest project? EGW: In recent years I've gotten into living history with my parents and some of our friends, and there are all sorts of projects that tie into that. I portray a German immigrant from the 1870s, an educated maiden lady who makes her living as a calligrapher. So I'm doing some costuming, some quilting, and some crochet to make my "kit," and for demonstration and display, I've been working on Celtic knotwork, calligraphy styles from different eras, and Spencerian handwriting as illustrated in the McGuffey's Revised Speller. In fact, one of my big projects this summer is digitizing a number of my pieces, along with some new ones, to sell through my new CafePress shop, The Frontier Calligrapher . Most of what I have for sale so far are German house blessings and Celtic knotwork, but I also plan to offer some Victorian poetry prints and a section I'll call "Doc Wolfe's Whimsies" for sillier original stuff. BH: What kind of books do you read for pleasure? Who is your favorite author or what is your favorite book? EGW: Pardon me while I laugh hysterically for a moment.... I have pretty eclectic tastes. My academic specialties are medieval British literature and theology and the Oxford Inklings; I decided early on in grad school that I'd prefer to study the works C. S. Lewis and J. R. R. Tolkien taught rather than the works they were reacting against. But I also enjoy Donne, Herbert, and Shakespeare for the Renaissance, Milton and Bunyan, Dickens, Kipling, Tennyson, Hopkins, the Brownings, Christina Rossetti, Mark Twain, Agatha Christie, Laura Ingalls Wilder... I do like some newer mysteries like the Cat Who series and the Tea Shop Mysteries by Laura Child, but mostly I stick with the classics. In non-fiction, I tend to prefer history and theology. I also read a few webcomics, like Girl Genius and No Need for Bushido, and a lot of fanfiction. BH: What will your next book be about? Any hints or news on it? EGW: Next up is Loyal Valley: Diversion, which wraps up the first phase of the team's investigation and sets up the second in a rather explosive manner. The titular diversion involves an attempt by the French to get the US involved in the Franco-Prussian War, but the case turns out to have more ties to Number Seven's conspiracy than anyone initially thought. I'm hoping right now to have it out in September or October, Christmas at the latest. BH: One tip for would-be writers? EGW: Every writer has certain strengths and certain weaknesses. One reason I write historical fiction, for example, is that I'm better at building alternate universes than I am at creating a realm like Narnia or Arda out of whole cloth. The only way to find out what your strengths are is to sit down and write, and the only way to get better is to keep writing. As G. K. Chesterton once said, "If a thing is worth doing, it is worth doing badly." BH: That is a great quote! Any parting words for our readers? EGW: Thank you for reading, and thank you, VM, for the interview! BH: And thank you for a wonderful conversation! Readers can find all of Elisabeth's books on both Amazon and Smashwords, and keep up with her latest news on her blog. Update: There is a 50% off sale for her books at Smashwords this July! Use coupon code SSW50.